My late aunt, Corrine (LaForest) Waldie, penned the following loving tribute to her father in 1987 for publication in Country Lines Magazine. This description of a father and his traditional lifestyle is emblematic of how my grandfather was described by everyone who knew him. His memory became for me a man who embodied ‘joie de vivre’ and whose very life was a tribute to his Métis, French-Canadian, and Indian ancestors. It is reprinted here, in an effort to safeguard such stories for the future, with permission from Michigan Country Lines and the Michigan Electric Cooperative Association. —JL, ed. My earliest memories of my father was his great love for the beautiful northern Michigan out-doors. He was a very dedicated sportsman. He loved to fish, hunt, trap, or just whittle things out of wood. He was also very talented. He could write poetry, draw and was musically inclined. He could play any instrument he picked up. He could make music with glasses, spoons, or a blade of grass. There seemed to be rhythm in everything he did. I remember him taking me trout fishing with him when I was young. We didn’t sit on a river bank and just fish — we walked, crawled, crept over and under through the worst jungles I had ever seen, to get to his favorite holes, where he always caught those beautiful pink brookies. was born at River Rouge. Needless to say, I still have the book and the poem. My Dad, Sam, may have been a little man, but to me he was ten feet tall. 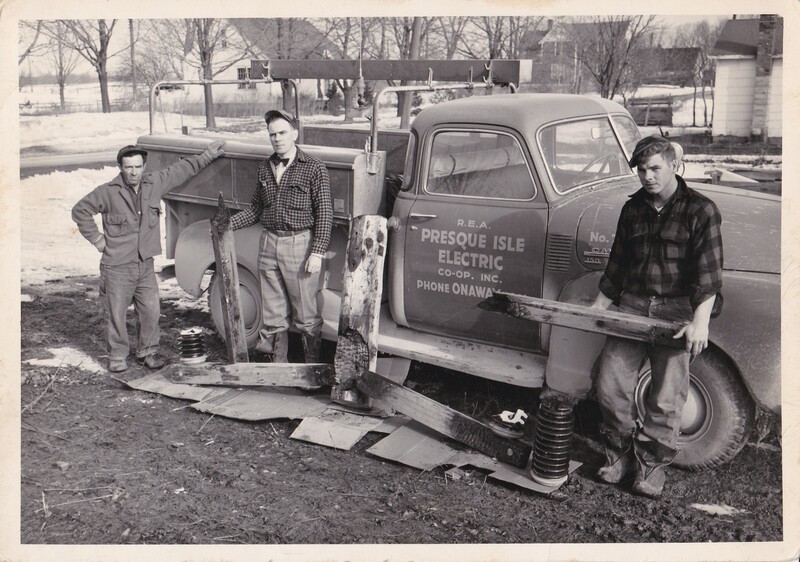 We moved back to his beautiful northern Michigan after the war and Dad went to work for the Presque Isle Electric Cooperative in Onaway, where he worked until his death in 1952. He loved every minute of every day working where he could enjoy the northern out-doors. Although he was young when he died, he left a legacy of love that still lives on in his children and grandchildren. 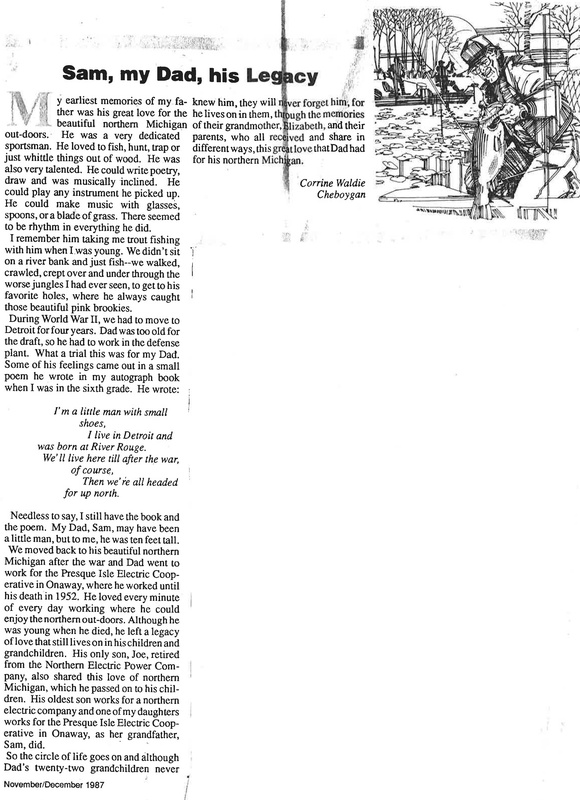 His only son, Joe, retired from the Northern Electric Power Company, also shared this love of northern Michigan, which he passed on to his children. And his oldest son works for a northern electric company and one of my daughters works for the Presque Isle Electric Cooperative in Onaway, as her grandfather Sam did. So the circle of life goes on and although Dad’s twenty-two grandchildren never knew him, they will never forget him, for he lives on in them, through the memories of their grandmother Elizabeth, and their parents, who all received and share in different ways, this great love that Dad had for his northern Michigan.